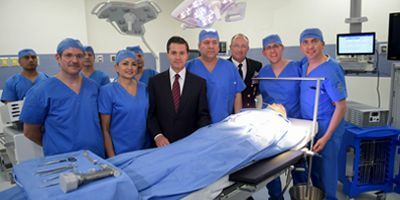 Last Wednesday the naval hospital was inaugurated by ex-president Enrique Peña Nieto. The high-tech hospital possesses five new operating theaters which are equipped with the latest technologies, e.g., a surgical robot. We are proud of our operating lights of the E and V series, ceiling pendants, electrosurgery units, such as maXium® smart C, as well as surgical instruments being part of this high-tech hospital. The expansion of the CEMENAV was one of the goals of the ex-government. Additionally the project was one of the most important ones in Mexico when it comes to healthcare.